Hi everyone, I am 52 and just got my 2nd bike. 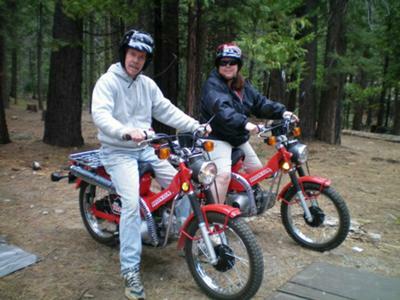 My first bike is a little 1984 Honda Trail 110 and it exactly matches the one my husband has owned for many years. 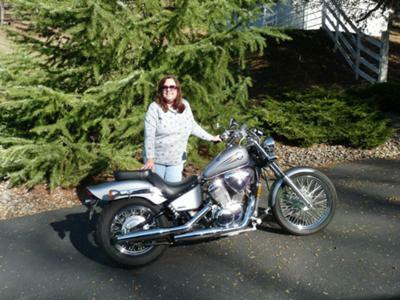 My new bike is a 2004 Honda Shadow 600 VLX Deluxe. I first learned to ride when I was 19 and rode a borrowed 175 to work when my other transportation was stolen. Then there was a long break of almost 30 years in which I rode only as a passenger. After getting my little trail bike, I took the MSF course and got my license endorsement. I have been wanting my own street bike for a while, and finally got an opportunity to get this Honda Shadow 600 very cheaply. It is perfect to learn on, The seat is low and the handlebars are not a reach for me. I am currently practicing in a parking lot until I get a feel for riding this bike, since it is so much larger than my little bike, which also has no clutch, so I need lots of shifting and starting on hills practice. In a couple weeks, I'll be ready for the road. I love my VLX, but I am now looking for a Shadow A.C.E. I got my VLX 8 years ago and it's perfect for me. And when I find the ACE, I got a few friends who want the VLX. It's a good bike! I just sold my '07 Shadow VLX 600 and got a bigger bike. The Shadow was awesome to develop my skills on. (I am 43 and hadn't ridden since I was 12.) You will love it! Take your time and build your confidence. Like the silver color! I have a red VLX Shadow that I love to ride! Congrats Tammy! The Shadow is a nice bike. That little trail bike looks like fun too! Congrats! I really like the look of that Shadow. What year is it? You're really going to like riding it on the road.